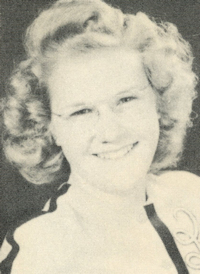 Obituary – Murch, Helen Marie (Palovik) « Perry High School Alumni Association, Inc.
Y-Teens ’46-’47; Library Staff ’47-’48. ﻿Former Perryan Helen Marie Murch, 65, died Thursday, July 31, 1997 at her home at Ardmore. Funeral was at 10 a.m. Monday at Christ Community church with Rev. Tim Lehman officiating. Burial was Monday afternoon at Grace Hill cemetery, Perry, under direction of Craddock Funeral home of Ardmore. An invitation was extended to family and friends to visit at the home of Duane Palovik, 611 Wakefield, Perry, following the burial. Casket bearers were Jim Pemberton, Jerry Blizzard, Everett Morris, Dee Bartgis, Glen Burns and Lenny Coloney. Honorary casket bearer was H. O. Nicodemus. Mrs. Murch was the daughter of John and Charlotte (Neuerburg) Palovik and was born at Perry on June 11, 1932. She and Bill 0. Murch were married at Newkirk on Feb. 26, 1949. Murch preceded his wife in death on Feb. 11, 1993. She was an avid golfer and a member of Christ Community church, Lakeview Golf club and Ardmore Duplicate Bridge club. Mrs. Murch was a National Life Master duplicate bridge player. Survivors include one son, David Murch, Great Falls, MT; two sisters, Deloris Patak, Perry, and Pat Lewis, Hanford, CA; two brothers, Duane Palovik, Perry, and John Palovik, Tulsa; two grandchildren and several nieces and nephews.